DESCRIPTION Coiled body balanced on two sturdy legs with slab and modelled details. Glazed in cream with sprayed effects. ARTIST'S STATEMENT It has always been a challenge to recreate the dodo, as there is such a contradictory batch of visual evidence regarding this bird. The genuine creature would have been tall, thin and agile. However it would be an image few people would recognise. The dodo has become such an emotive subject and an iconic image. 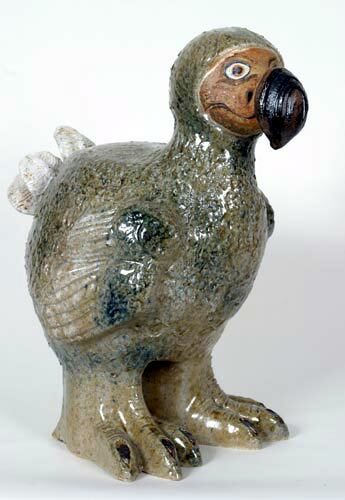 I have tried to portray the dodo as a humorous, gentle and eccentric individual.